There is probably not a more versatile plant in our landscape than rosemary. It makes a great hedge, tolerates salt spray, dry sandy soils, smells great, has medicinal properties and is a tasty spice. This fragrant shrub lends itself to formal or informal pruning and fills a niche most landscapes. Rosemary, a woody perennial herb, can grow to six feet tall but is easily maintained at well below that. Some varieties are trailing. Rosemary responds extremely well to pruning and is one of the few woody evergreen shrubs that grow well in oceanfront applications. It thrives in sun to partial shade. The pleasing distinctive smell makes it ideal around a porch or patio. Dense needle-like leaves usually display slight variegation. Blue edible flowers emerge in spring. Some cultivars may have white or lavender blooms. Petals liven up and add color to salads, biscuits, and jellies. Leaves add flavor to vegetables and meats. I think they are almost indispensable in marinades and stuffing for poultry, chops or fish. Don’t leave rosemary out of your marinara sauce either. Use leaves fresh or dried. Place foliage in a saucepan on the stove with plenty of water. It makes great simmering potpourri. Stems, especially blooming ones are great for wreaths and floral designs both fresh and dried. Rosemary is hardy here, but not too far north of this area; so many people grow it in pots and place them in south facing windows during winter. They prefer humid conditions but should not be over-watered. Plants are easily propagated by seeds or cuttings, so you can have plenty to share with neighbors. Besides landscape beauty, culinary uses, and air freshening, rosemary is used extensively as a medicinal herb. Leaves are high in antioxidants and aid in cell maintenance. Plant oils have blood thinning properties and are a strong diuretic. Due to these traits significant doses generally reduce blood pressure and are often used for that. However, if you are already on blood pressure medication don’t consume high quantities of rosemary without clearance from your doctor. Small amounts used in seasoning are inconsequential. Rosemary infusions are used topically as anti-inflammatories for arthritis. Preparations are also used to relieve menstrual cramping and water retention, but pregnant women should avoid high doses. Research shows there might be an increase in the chance of miscarriages. Again, spicing food isn’t a problem. 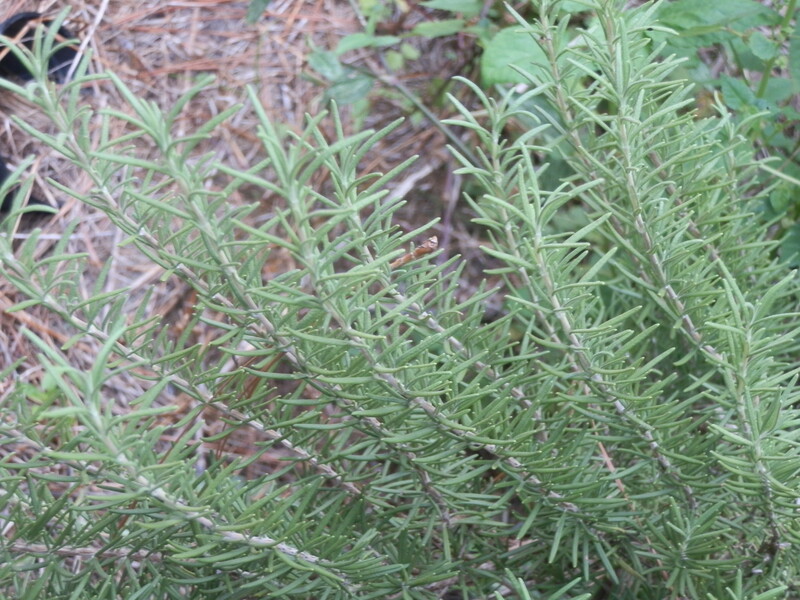 Rosemary is often used in many hair care products. Part of the reason is its fragrance. However, numerous sources claim regular use of rosemary oil helps stimulate follicles and allows hair to grow longer and stronger. It is also believed that regular use of rosemary oil slows down premature hair loss and graying of hair. Some commercial dandruff preparations include rosemary oil. Research is also being conducted on the effectiveness of rosemary in treating various cancers, specifically breast and prostate cancer. Powerful antioxidant chemicals are a likely reason. For centuries herbalists claimed rosemary was effective for preventing memory loss. Research is ongoing for using the herb to treat Alzheimer’s. This entry was posted in foraging and tagged diuretic, foraging, gardening, herb, marinade, medicinal, nature, perennial, rosemary, simmering potpourri, spice, woody. Bookmark the permalink. Its good to know there are natural herbs to cure such illnesses. I too use rosemary in some of the things i enjoy making as far as sauces and marinades. If rosemary could some how help prevent or reduce the risk if cancer , it would be a wonderful thing to have because you can throw it in almost any dish you make to add flavoring and you won’t realize your eating to prevent hair loss/graying, and even reducing blood pressure. i always known you could cook with rosemary i just never knew it added color and it was used for hair care produces. I didn’t realize that rosemary had so many uses. When I thought of rosemary I thought of using it for cooking and cooking only. It’s really increadilbe that it can be used for medical uses and hair care products. The Roasemary plant is a beautiful and has the most fragrant smell. I love to have them around my house they bring in a fresh aroma to the decor. It is fascinating that they use rosemary in medical uses. I didn’t know it could help with menstrual cramps. I hope they continue the research they have with rosemary having a part in curing cancer. I have Roasemary in my yard byt he pool and thedeck but i didnt know that it had so many different medical uses or any for that matter. I can tell a Roasemary from any other plant just by the smell of it and I love it on my chicken. I never knew that the Rosemary plant had so many uses medically an other ways to help your body. The most surprising to me is that it helps from hair loss and makes it stronger. I never knew that the rosemary could be used in food and rosemary plants had so many uses in medically another ways to help our body. I like how the rosemary plant can be used in many different ways food related and medically related as well. I also didnt know that rosemary is being researched as a cure for alzheimer’s disease. i had no idea it could help with menstrual cramps! we used to grow rosemarry and use it all the time. i had no idea they used this for menstrual cramps, we used to grow some and use it in foods all the time. This is one of my favorite spices. My sister uses it in her spaghetti and almost all of her sauces. It adds a great teast to any food. I love the smell of Rosemary. Its so good to know that it can be used to help menstrual cramps,. It’s amazing how many purposes Rosemary, which I’ve mostly known to be a fragrant spice, really serves. I was really intrigued by how it aids hair growth and health. i think its amazing The rosemary has so many different uses. not only to be used with your favorite food, but alsohelp with medical needs. it is a very neat plant. I think that it is interesting how rosemary has many uses. I love that it help with medical problems. But i never knew that it may increase the risk of miscarriages if you eat to much. I love rosemary ! My friends is Asian and her mom cooks a lot nd she uses fresh rosemary in some of her dishes and I love it ! Yummmmmm ! It’s also good to learn that its good for high blood pressure , because my grandmother has high blood pressure and I can see if its okay to add this to some of her meals ! Never knew how many different things the rosemary bush could help with. My step mom has a couple rosemary bushes in my house I only thought you could cook with them. My dad has always used rosemary as a prime ingredient in his sauces and marinates as long as i can remember. I knew that rosemary had such a distinct smell, because of the wild plants in the corner of my backyard. But little did i know that rosemary had such a wide variety of uses, from medical to your basic everyday uses. I also think its a wonderful thing that they’re performing research on the effects of rosemary to treating cancer, a natural herb is much safer than the harsh radiation they typically use. I knew rose mary was edible… but never realized that it could be used for medical use as well as for slower ageing of hair. i have 4 rosemary bushs by my house. i like the smell. im not a fan of rosemary as a sesoning. I would of never guessed you would use rosemary as a medical use and i didn’t think rosemary got very bigger either. Rosemary is great with baked porkchops ! Yummmmmm , I love this stuff ! I knew Rosemary was used for coking but i didnt think it was that large and i didnt think it had other uses Besides adding Flavor to vegetables and meats for cooking. i knew rosemary was was used for somethings, but id never think that it was used for so many things. I think they should continue research on rosemary curing cancer, that amazes me. I knew that the plant was used for cooking but never knew about the medical uses. When I was a group leader at Ag day we stopped at a booth where this man talked about rosemary and how it repels bugs. He had a bottle of bug spray made from rosemary. he sprayed it on my hand and it smelled way better than regular bug spray and its much safer. It had a very strong smell at first but the smell subsided and it wasn’t as strong. WordPress accounts are free unless you want to own your own domain. Even at that it’s only something like $28 per year. The instructions are simple, just like setting up a facebook or twitter account (I use neither.) I’m way behind on my postings, mostly because of photography issues (I like to post pictures with my articles). I’ve got probably 40 more postings I need to get up. I hope this helps. it is a beautiful plant and has the most fragrant smell. The natural herb can cure illnesses and its edible. It smells good you can add color and being used for hair care products. Rosemary has a many of uses, but what I did not know that it could be uses or help with menstrual cramps. my mom uses rosemary in almost everything she cooks it always give it that little bit of extra flavoring or so she says, but I never knew it could do so much for our health. I did find it interesting that it could help as an anti inflammatory for arthritis.